Emmylou Harris was 30 at that time, and she is here accompanied by The Hot Band: Albert Lee, Emory Gordy, John Ware, Glen D Hardin, Rodney Crowell, Hank Devito. Superb band! They run through what was to become a greatest hit set, lovely rendition of well-known songs. The Highlights for me are, Making Believe and Luxury Liner. Emmylou recorded some of her best albums with The Hot Band, one of the best backing bands in country history. The concert was recorded for the Old Grey Whistle Test in 1977. 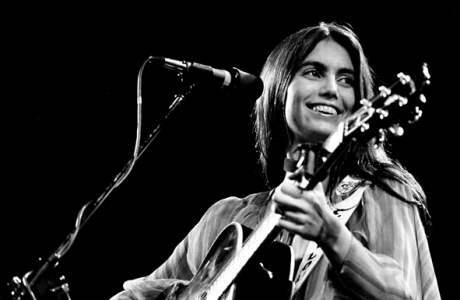 “Popular myth has it that Emmylou was discovered by Gram Parsons and rushed off to LA & stardom. The reality is a little different and interviews with Emmylou and others suggest the following. Chris Hillman credits Rick Roberts with telling him to go and see Emmylou. Chris met Emmylou and he later invited her to join the Flying Burrito Brothers. However, the Burritos broke up shortly afterwards and Emmylou continued to play clubs in and around Washington DC. In September 1971 Chris Hillman persuaded a reluctant Gram Parsons to see Emmylou play at a club called Clydes where she had a gig for 3 nights a week. They worked up and performed two songs; I Fall To Pieces & Thats All It Took. Gram Parsons, by now converted, then left Emmylou with promises of some recording work on his forthcoming album. Their meeting was followed by a gap of about a year.true religion jeans During that time Emmylou carried on playing in bars and getting the occasional phone from Gram to say that the recording would happen any time now. Finally, Gram sent Emmylou an airline ticket and invited her to sing on GP. The album was released in January 1973 and Emmylou spent $500 made from GP on a brand new D28 guitar and joined the tour band, The Fallen Angels, formed to promote the album. In Summer 1973 Gram recorded Grievous Angel but, unfortunately he died in September of that year. Emmylou returned to Washington and fronted her own band, The Angel Band, playing as many as four sets a night with a repertoire of over 40 songs. In 1974, Mary Martin at Warners arranged for Emmylou to meet producer Brian Ahern. Warners agreed to sign her on condition that Ahern produced the album and Emmylou signed with Warners in October 1974. Her first Warners album Pieces Of The Sky was recorded with a mixture of The Angel Band and many of the musicians from the Gram Parsons albums. Warners then told her to “get a hot band”, which she did by persuading James Burton, Glen Hardin, John Ware, Rodney Crowell, Hank de Vito and Emory Gordy to form The Hot Band. In Spring 1975 the newly formed band rehearsed in LA without James Burton or Glen Hardin, who both had commitments with Elvis. The missing Hot Band members drove up overnight after the Elvis show finished and had just one rehearsal with the full line-up. The band then took one night off for a birthday party for Emmylou in a Mexican restaurant. They then played three nights at the Boarding House, San Francisco in with their first appearance as Emmylou Harris and The Hot Band taking place on April 3rd, 1975. The rest, as they say, is history. James Burtons stint as lead guitarist came to an end when Albert Lee joined the band. Albert Lee saw Emmylou at a club called the Laguna Bowl in early 1976 and Emmylou planned to ask him to join the Band when James Burton left. This plan was accelerated when James Burton fell ill with flu and Albert Lee first played with The Hot Band at The Branding Iron in San Bernadino in February 1976. Frank Reckard replaced Albert Lee two years later and stand-ins over the years for 1-off gigs have included Bob Warford, Jay Lacey and Vince Gill.